on at Gus Fisher Gallery in Auckland from 1 July - 20 August. Opening Friday 1 July at 5.30pm, with guest speaker Robin White. vibrant screenprint designs on a variety of fabric supports, and engravings on metal. Christchurch Polytechnic Institute of Technology and the CPIT Foundation. and photocopy on acetate, 147x109cm. after endless humiliating exposure as victims in the media. adding the words of their testament in inscriptions that invade the spaces around their heads. to public corruption and personal tragedies in post-apartheid South Africa. to linger over events that viewers might otherwise avoid. and more contemporary incidents of suffering in the church. to suggest the vulnerability of abused children. Michael Reed (NZ) uses fabric supports for many of his prints to convey a social imperative. 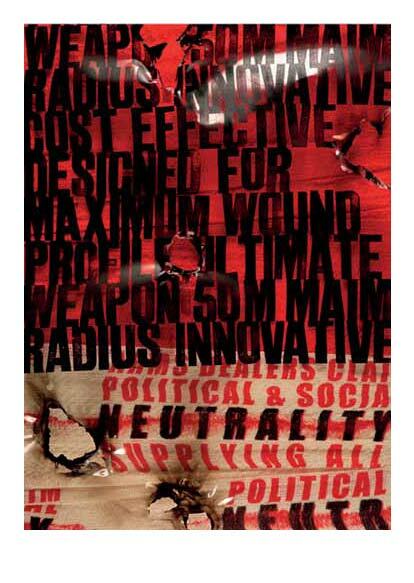 to contribute additional layers of meaning to the transfixing texts imprinted on his works, indicting those who make and sell arms for profit. to create forms that unite visual delight with social acuity.